Playing Ahab to our white whale of a gaming PC, we searched and yearned, but did nothing more…until late last year. In a moment of half whim, half curiosity (after watching/reading ever review we could possibly find), we picked up the 4GB base model of Dell’s Alienware Alpha. Billed as a “Steam machine” of sorts, the Alpha…well, what is it? In a nutshell and sleek, black casing with nice LEDs, it’s Steam’s gaming platform built on top of Windows 8.1. (No Steam OS, sad face.) Even though we knew this going in, we were still taken aback by the fact that you had to set it up like a regular PC using the icky Windows interface (And as a lifelong PC-user, I use “icky” in the most loving sense.) With the Alpha came only an Xbox 360 controller, no keyboard. The designers made something of an ingenious if, in the end nefarious controller-mouse scheme whereby you used button clicks on the controller to move the mouse. Yeah, sure. With two USB ports out front, we readily hooked up a mouse and keyboard and spared ourselves from the agony of that. Once we had the Alpha backend set up and the thing hooked up to the Internet, we booted up Steam. Although we did had to sit through some nightmarishly long load times, logging in was fairly straightforward, and we were cheerily greeted by Steam’s…Big Picture mode?? Ugh, but oh well. Having avoided Big Picture mode on my laptop, it took me a little time to get used to navigating it. All that really mattered was making sure we could access our games, which turned out to be easy enough. The game library with its large tiles and organized look was really quite accessible. So this would be the point in my quasi-“review” where I give some sort of recommendation about the Alpha. Maybe score it against its competitors. Maybe offer up some pros and cons. But the sad, horrible fact of the matter is that I haven’t used the Alpha often enough to be able to say anything other than “so far it works fine.” It’s a solid device that does what it claims to do – I’ve simply haven’t been playing Steam games lately. Way back in November and December 2014, the Alpha was all up in the news. People were talking about it on sites bit and small, and most reviews boiled down to “good but not great.” The Alpha in any of its forms – from our lowly 4GB model with an i3 processor and 500GB hard drive to the 8GB model with an i7 processor and a 2TB hard drive – is not a gaming PC. And it’s certainly not a console killer. And we know full well that the money we spent on the Alpha could have gone towards the makings of a serviceable and upgradable gaming PC. So why take a chance on the Alpha? For us it currently serves a couple purposes. First, it’s a stopgap between not having a gaming PC and having one. And second, it’s allowed us to easily access Steam in the open comfort of our living room. In an ideal future, I think we pictured ourselves playing Steam games together or with others, which is hard to do when you’re stuck at a desk. Needless to say, this vision has not materialized. The hype surrounding the Alienware Alpha died down considerably at the turn of the new year, and I can kind of see why. 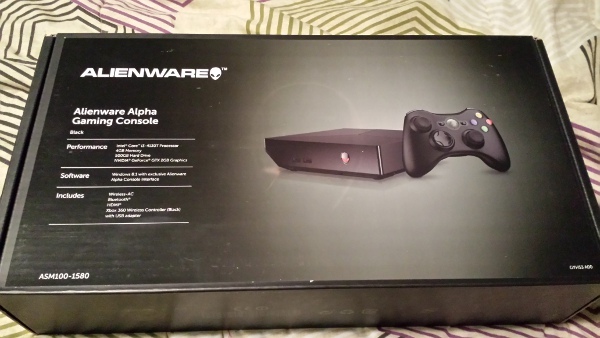 The Alienware Alpha, while novel, isn’t a vital addition to one’s gaming setup. People who regularly access Steam probably already have a gaming PC set up which pleases them. People who regularly game probably already have a console or three with vast libraries of games at their disposal. If the Alpha was a true “Steam Machine” with a dedicated OS, it’d be more of a game changer. As it is, I like having the Alpha at my disposal – it has been great for making quick purchases and checking out the sales – but if we were looking to purchase it today, I think it’d be a much harder sell. If you have an Alienware Alpha, tell us about your experience with it. If you’re a Steam user without one, could you see a place for this device in your house? Or is the Alienware Alpha destined for the bargain bin? Judging by all the comments I didn’t get on my most recent United We Game post on the Alienware Alpha, I can only assume that no one cares about this not-quite “Steam Machine.” Or maybe it was due to Easter weekend, and everyone was busy with Easter-y things. Well, I do have to admit that the latter was the case for me, so it’s not like the Alienware Alpha was on my mind either. Touche? Um…that’s not how it works. In any event, the Alienware Alpha, a little box through which one can play Steam games, hit the radar really hard late last year and then shattered into oblivion…though not quite because they are still for sale…I think. One of them has been in my house for the past three months; click the article below for some initial impressions. Strangely enough, I’ve never actually heard of this thing. But, maybe it’s not so strange because I don’t play PC games (aside from Slender: The 9 Pages). The only time I looked into Steam was to download the original Portal. It’s quite expensive to get a console version. In the end, I chickened out of actually getting it. Hopefully this device will end up being worth your money. And hopefully you’ll get that gaming PC one day, too. Aw, thanks. While this isn’t yet a regret-filled purchase, the poor Alienware has been something of a dust-catcher lately. Right now, the problem is finding time to play, and there just isn’t any! So even if we did have a swanky, new PC right now, it’d probably be suffering the same fate. But I do still like the idea of easily being able to access our Steam library at a moments notice, so the Alienware isn’t going anywhere for awhile.